In this delightful show, Olive Ayhens turned the world inside out—or, more often, outside in. 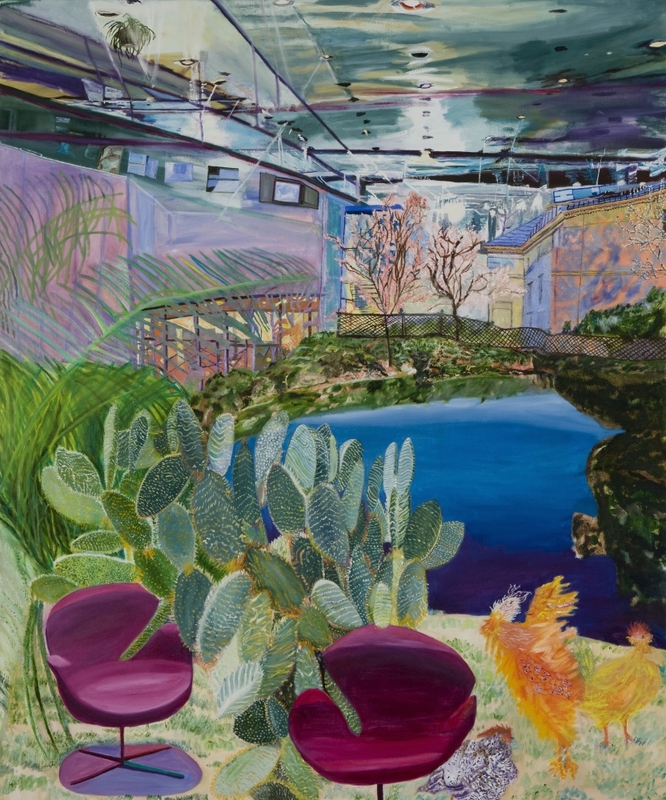 With saturated hues and an expertly careless touch, her paintings depicted surrealistic landscapes in which nature intrudes on industrial spaces, or industry overtakes the environment. Throwing together escalators and rivers, jungles and hotel lobbies, Stonehenge and superhighways, these upbeat works carried a more serious message about global warming and environmental concerns. In the painting Interior Wilderness (2009–10), the lobby of a Las Vegas casino filled with crystal chandeliers collides with a shopping plaza’s glare of fluorescent bulbs. Beneath this futuristic setting, an artificial pond overflows, flooding the space and filling it with hordes of frogs. It is surreal, yet uncannily accurate. In Sheltering Nature (2011), a ghostly plain of dying trees is entrapped within an enormous greenhouse, while a single deer looks out at viewers. Here, nature may be nurtured, but more likely suffocated by human intervention. Ayhens’s playful painting style rescued these works from being one-note, didactic allegories about environmental destruction. Instead, they captured landscapes with loose and loopy brushwork. Ayhens, like a 21st-century Raoul Dufy, expertly turned her nightmarish pairings of man versus nature into intriguing dreamscapes.